Welcome to JATCO Marine Products Division Online. Here you can browse through our online brochures for seven of our most popular products, including our flagship product the Trillogy Dinghy Lift which is now available in three different styles. We have packed the site with tons of information on our products, please take the time to thoroughly navigate the site before calling for more information. New! 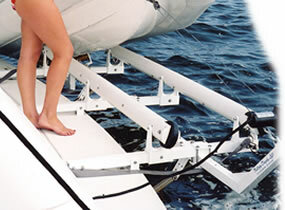 We have added over 210 new photos of boats with Trillogy Dinghy Lifts installed, take a look.